Wouldn't it be great to be able to sound like Spongebob Squarepants whenever you wanted to? Can you imagine pranking your friends or relatives and making them think that Spongebob is on the other end of the line? It would surely lead to a bag of laughs! Here at Celebrity Voice Changer, we have set about recreating Spongebob Squarepant's iconic voice perfectly. Because of Spongebob's unique voice it was not easy to manage this. We are very proud of the Spongebob voice changer we created and invite you to test it! Spongebob and his friends have been living in the city of Bikini Bottom since 1999 and we have all been following their amusing lives since then, and still do today! Created in 1999 by Stephen Hillenburg for Nickelodeon the character is loved by millions of people the world over. Stephen Hillenburg is an animator and marine biologist by trade and got his inspiration to create the character from here. 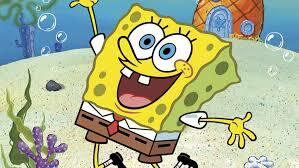 Spongebob Squarepants became Nickelodeons best rated series ever and sparked the creation of a multimedia empire. A full feature film was also released in 2014, the film was titled The Spongebob Squarepants Movie. This film was later followed by a similarly successful sequel. Getting a call from Spongebob would be the envy of your friends! Now it is possible to sound exactly like your favourite cartoon character by downloading our app and recording your voice. We will then change your voice to sound exactly like Spongebob! You can call your friends and invite them to go to the Krusty Krab with you for a drink! Spongebob and his friends often visit the Krusty Krab and grab a bite to eat while catching up with each others daily lives. Spongebob and his friends, Patrick, Sandy, Squidward and Plankton can always be relied on to provide entertainment. Spongebob is one of televisions most famous characters and is known worldwide. His voice is instantly recognisable and uniquely Spongebob. You can have a lot of fun by making yourself sound like this famous character. Our Spongebob voice changer is so accurate that you can even fool Mr. Krabs himself. Spongebob is all about having fun with your friends and that is why we created this Spongebob voice changer, so that you can have fun with your friends. Spongebob is the best known resident of Bikini Bottom and has many great friends who share his adventurous life with him. Spongebob's is voiced by American actor and voice artist, Tom Kenny. Using a sample of this voice we were able to recreate Spongebob's voice in high quality detail to use on our app. There are endless ways to have fun with our recreation of Spongebob's voice and it will keep you entertained and laughing for hours on end. Stephen Hillenburg created the character to celebrate his fascination with the ocean and teach others about the many interesting facts that the ocean has to share. Come on, download our Spongebob voice changer today and experience the joy of Spongebob for yourself.